A large proportion of falls and fall injuries in older people are due to multiple risk factors, many of which probably can be modified or eliminated with targeted fall prevention interventions. These interventions must be feasible, sustainable, and cost effective to be practical for widespread use. The most promising prevention strategies involve multidimensional fall risk assessment and exercise interventions. Incorporating these intervention strategies whenever feasible into a fall prevention program seems to be the most effective means for fall prevention in older adults. 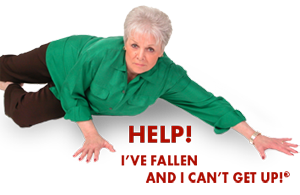 Falls are a common and complex geriatric syndrome that causes considerable mortality, morbidity, and reduced functioning. Falls have multiple precipitating causes and predisposing risk factors, which make their diagnosis, treatment, and prevention a difficult clinical challenge. 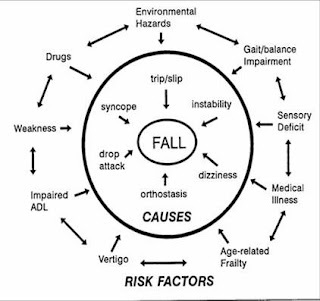 A fall may be the first indicator of an acute problem (infection, postural hypertension, cardiac arrhythmia), may stem from a chronic disease (Parkinsonism, dementia, diabetic neuropathy), or simply a marker for the progression of “normal” age-related changes in vision, gait, and strength. 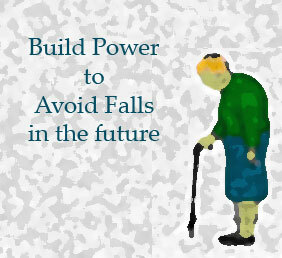 Falls are extremely common among older adults. 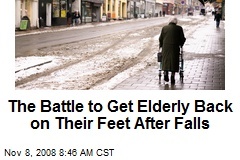 Each year, about one out of three people older than 65 years, falls. Falls cause considerable mortality and morbidity. 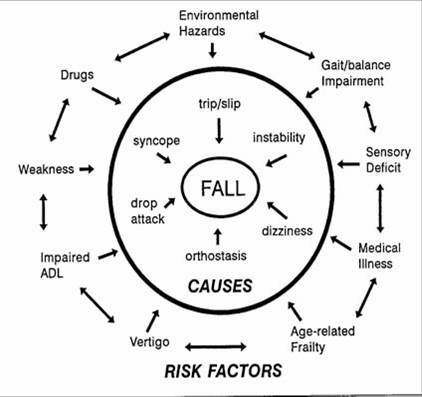 The propensity for fall-related injury in elderly persons is due to a high prevalence of clinical diseases (e.g. osteoporosis) and age-related physiologic changes (e.g. slowed protective reflexes) that make even mild fall particularly dangerous. Although most falls produce no serious injury, between 5% and 10% sustain a serious injury, such as a fracture, head injury, or serious laceration. Besides death and physical injuries, falls are also responsible for the admission of previously independent elderly person to long-term care institutions. Fear of falling also has been recognized as a negative consequence of falls. Between 30% and 73% of older persons who have fallen acknowledge a fear of falling. This post-fall anxiety syndrome can result in loss of confidence in the ability to ambulate safely, which will result in further functional decline, depression, feelings of helplessness, and social isolation. There are a variety of causes for the falls. As for intrinsic factors, there are gait and balance impairments, peripheral neuropathy, vestibular dysfunction, muscle weakness, and dementia. As for extrinsic factors we can have poor footwear and restraints. Leg weakness was identified as the most potent risk factor associated with falls, increasing the odds of falling by more than four times. Individuals who have fallen have a threefold increased risk of falling again. Although recurrent falls in an individual are due to the same underlying cause (e.g. gait disorder, orthostatic hypotension), they can also be an indication of disease progression (e.g. parkinsonism, dementia) or a new acute problem (e.g. infection, dehydration). Gait and balance disorders are also common among older adults, and affect between 20% and 50% of people who are older than 65 years. Several studies report that healthy older persons with a history of falling have significantly weaker leg strength than non-fallers. The gait analysis was also studied and it was found that fallers had significantly slower gait speed and shorter stride length than non-fallers. It was proven that deficit in the ability to control lateral stability was associated with an increase risk for falling. Other studies found a significantly correlation between falls and single leg stance, postprandial hypotension, impaired depth perception, musculoskeletal pain, and foot problems, for example. Arthritis, the most common chronic condition in persons of 70 years of age in the United States, increases the risk of falling about 2.4 times. The relationship between arthritis and falls most likely is related to the gait impairment and weakness that often are associated with arthritis. Functional impairment, usually indicated by the inability to perform basic activities of daily living (e.g. dressing, bathing), doubles the risk of falling. Depression is associated with about a twofold increased risk of falling, for it may result in inattention to the environment, or cause more risk-taking behaviors (e.g. poor self-rated health, cognitive impairment, functional impairment, slow gait speed). Cognitive impairment almost doubles the risk for falling. Confusion and cognitive impairment are cited frequently as causes of falls, and may reflect an underlying dementia illness. Dementia can increase falls by impairing judgment, visuospatial perception, and orientation ability. Falls also occur when they wander, attempt to get out of wheelchairs, or climb over bed side rails. It affects 5% to 15% older than 65 years old. Fall prevention interventions can be categorized into several broad categories: multidimensional fall risk assessment and risk reduction, exercise programs of various types, and environmental assessment and modification. The objective of this parameter is to identify risk factors for future falls and to implement appropriate interventions to reduce fall risk. This assessment should include a history of fall circumstances and medical problems; mobility assessment; examination of vision, gait and balance, and lower extremity joint function; basic neurologic examination, including muscle strength and mental status; and assessment of cardiovascular status. This can be complemented with functional performance tests of gait, balance, mobility, or strength, such as the Timed Up-and-Go test, the Performance Oriented Mobility Index, and the one-leg standing balance test. An environmental assessment of the individual’s living location can also be done. Exercise can improve important fall risk factors, such as muscle weakness, poor balance, and gait impairment. There are exercise programs that are designed as fall prevention interventions, and should be supervised by a physical therapist, two or three times a week for an hour. These programs include a combination of exercises to improve flexibility, strength, balance, and aerobic conditioning. Progressive strength training generally focuses on lower and upper extremity large muscle groups, and may use body weight, ankle weights, elastic bands, or weight machines for resistance. Balance training often includes a range of static and dynamic exercises (e.g. standing on one foot, tandem stand, ball games, movement to music) and functional activities (e.g. reaching, bending, transferring). To improve aerobic conditioning, whole body exercises should be considered, such as walking, stair climbing and stationary bicycles. PNF chi (Tai chi associated with PNF) is another type of exercise for improving balance and reducing the risk of falling, which consists of a series of slow, rhythmic movements that require trunk rotation, dynamic weight shifting, and coordination between upper and lower extremity movements. Environmental assessment and modification is another promising fall prevention strategy, which is used as a means of identifying and removing potential hazards (e.g. clutter, poor lightning, throw rugs, unobstructed walkways) and for modifying the environment to improve mobility and safety (e.g. grab bars, raised toiled seats, lowered bed height, shower chairs, furniture that is easy to rise from).